Rodney Langaas, 86, of Greenbush, MN, died Monday, January 21 in Sanford Medical Center in Fargo, ND. Rodney Jerome Langaas, the son of Henry and Inga Judith (Haagenson) Langaas, was born December 24, 1932 at Greenbush, MN. He attended country school near his home in Lind Township, Roseau Co., rural Greenbush, MN. He later attended Crookston Agricultural College at Crookston, MN. He served in the U.S. Army, during the Korean War and proudly served on the DMZ during a time when the DMZ was initially formed and very active. After he was discharged from the Army, he moved to the Twin Cities area and worked several jobs. He married Shirley Magnuson on April 11, 1959 in Minneapolis, MN, they moved back to Greenbush. Rodney was engaged in custom farming and Insurance and Land Sales. He was the co-owner of Agassiz Insurance and Realty for many years. 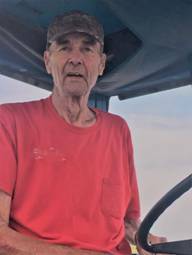 He retired from the insurance business when he was 76 years old and continued to do custom farming up until this past summer. He was a member of Bethel Lutheran Church in Greenbush, Post 88 American Legion of Greenbush and the VFW in Roseau, MN. He was a charter member of the Greenbush-Badger Lions Club, a former member of the Greenbush School Board, Bethel Lutheran Church Council and the Greenbush Hospital Board. Rodney enjoyed Professional Bull Riding (PBR) and played a role in bringing PBR to NW Minnesota. Rodney also enjoyed farming, land sales, snow catting, ice fishing and his family. Rodney and Shirley enjoyed traveling together back when he was in the insurance business and traveled to several different countries and in the US. He is survived by his wife of nearly 60 years—Shirley. Children—Elizabeth (Kevin) Zillich of Taylor, ND, Sonia (Wayne) Lee of Greenbush, Sandra (John) Ehret of Lake Elmo, MN & Donovan Langaas of Karlstad, MN. Grandchildren—Britany Wyland, Lindsey Hasson Boyum, Lane Hasson Nordin, Colten Zillich, Bridget Zillich, Tanner Zillich, Shaun Jevne, Jason Jevne, Kayla Lee, Dayton Langaas & Darrin Langaas. Great-Grandchildren—Brooks Nordin, Hadley Nordin, Scout Nordin, Boone Nordin, Liam Boyum, Luca Boyum, Lennox Boyum, Vera Zillich, Ethan Demello-Rice & Aria Demello-Rice. Brothers—Vernon Langaas and Wesley (Donna) Langaas of Karlstad, MN. He was preceded in death by his parents—Henry & Inga Langaas, a sister—Yvonne Langaas and a brother—James Langaas. Funeral Services were held on Saturday, January 26 at 11 AM in Bethel Lutheran Church of Greenbush with Pastor Ken Bowman, officiating. Jerry Axvig was the Vocalist and Linda Sovde was the Accompanist & Organist. Pallbearers were Vern Langaas, Wayne Lee, John Ehret, Kevin Zillich, Harvey Dallager & Gary Trangsrud. Honorary Pallbearers were Rodney’s Grandchildren. Military Honors were provided by the Moen-Zimek Post 88, American Legion of Greenbush, the Roseau Memorial Honor Guard and the National Guard. Burial will be in Bethel Lutheran Cemetery in the spring. Arrangements are with Gieseke Funeral Chapel of Greenbush.